Holy reno inspo! 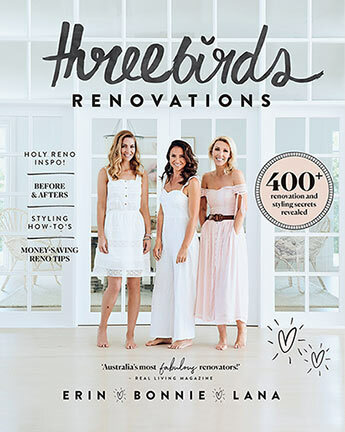 Before & afters Styling how-to's Money-saving reno tips 'Australia's most fabulous renovators' Real Living magazine When best friends Erin, Bonnie and Lana ditched their corporate careers to start Three Birds Renovations, they were rookie renovators with big ideas. Today, with many incredible house transformations under their toolbelt, they're a power trio turning neighbourhood ugly ducklings into swans. If you lust over images of beautiful homes but feel stuck when it comes to your own space, these 'birds' have your back. The book is packed with gorgeous details from their projects, friendly words of encouragement and more than 400 reno tips to help you avoid budget blow-outs, manage trades and timelines, and style without stress. Whether you're starting small or going all-in with a whole-home reno, this is destined to become one of the most useful books you own. Turn your reno dreams into reality!